By the end of May, the days are lengthening and the temperatures are beginning to rise—ideal conditions for dining 'al fresco', Italian for 'in the fresh air'. 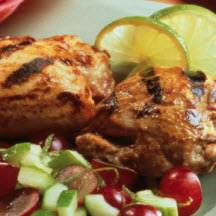 To best enjoy the fresh air, try this light and simple chicken recipe to celebrate the end of cooler days and usher in the first months of summer. Brush both sides of each thigh with some honey mustard and set them aside. In a medium bowl, stir together the ingredients for the salsa and set it aside. Grill or sauté the chicken until just firm. Serve the chicken immediately with some of the salsa spooned alongside. Recipe provided courtesy of the National Chicken Council. Used with permission.